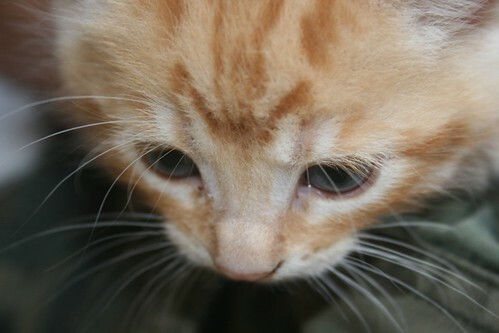 … because it includes pictures of dreadfully cute kittens… yay! This as-yet-unnamed specimen is destined to be a farm cat — yes, shock, a working cat… catching mice, vermin, etc. — but he had some time in between drinking milk and discovering the world to visit us today. There are a few more shots in my flickr feed, but no LOLcats photos sadly, as we can’t locate our invisible bicycle. This entry was posted in General and tagged blog, cat, kitten, tabby, website. Bookmark the permalink. How do you plan to prevent it from helping to kill off the native wildlife? It’s a cat. Cute or not, by definition, it is evil and should not be touched with a ten foot bargepole.